They are not aiding in my weight loss mission at all. But they are so darn tasty. Lemon ones are my favorite. Has anyone had a go at baking them yet? 13 Apr	This entry was published on 13/04/2012 at 6:17 PM. 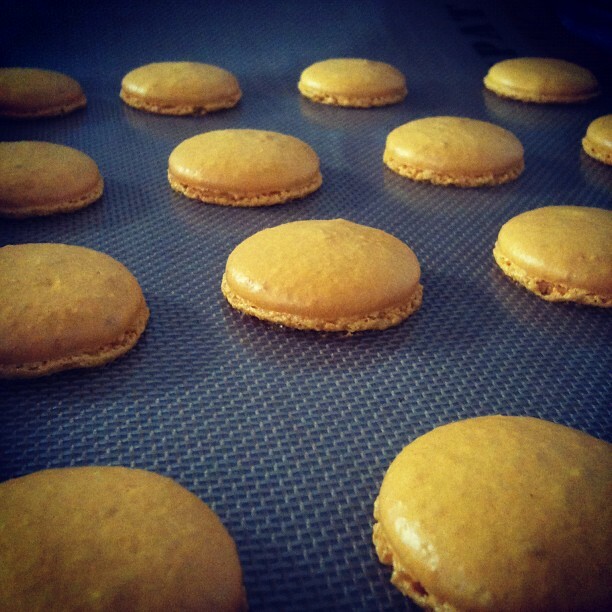 It’s filed under baking and tagged macaron, macaroons. Bookmark the permalink. Follow any comments here with the RSS feed for this post. They really are. My husband is lucky I’ve saved some for him. You’re killing me! I wish I was there to help you gobble them up! I want to make some, but I need to get some Silpats first, and I’d really like to get the piping tube you got. I have one of the old plastic-coated fabric ones, and it’s a pain to clean! It’s a shame you’re not here! My husband is lucky I’ve save some for him. I do love my Silpats. They work great and are reusable, win-win. The fabric piping bags are definitely a pain to clean. I used to have one and then decided to use the piping gun and it worked. It has different shaped attachments so you can use it for various piping needs. Love it! Wow! 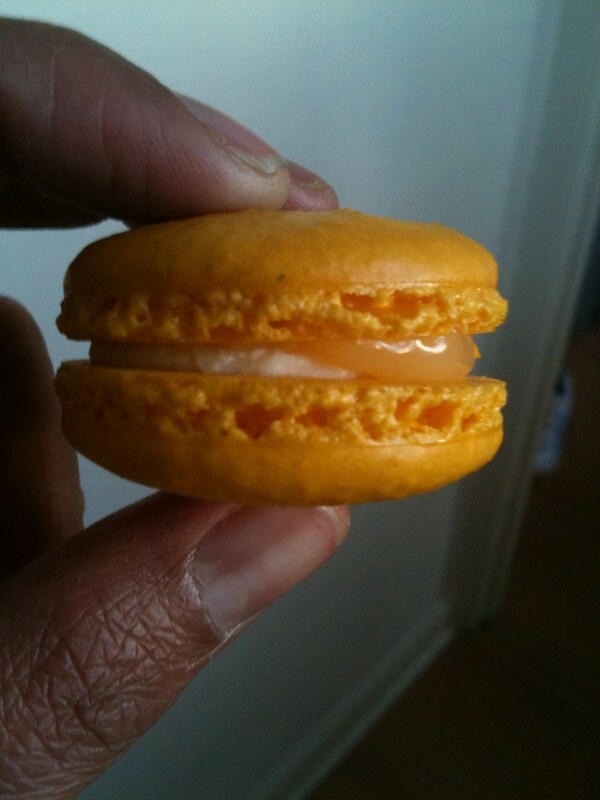 I don’t know how your macarons turn out so perfectly every time– you’re amazing!! I can just smell the lemon. I have to try these someday. I’ll remember… sift! They look so good. Brilliant! If I made something so perfect, I don’t think I’d stop either! What do you mean by aging the egg whites? I think you just sold me on the lemon ones. They look amazing. Aging, or drying, the egg whites is when you set aside the egg whites in a slightly covered container for one or two days in the fridge. 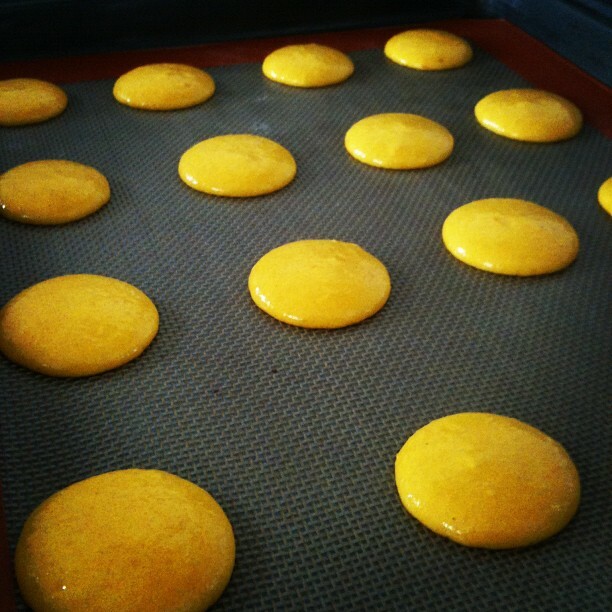 That allows some of the moisture to evaporate, which is crucial to produce the a great macaron shell. Another method some people use is to microwave the egg whites for a few seconds. I don’t do this in fear that I’ll end up cooking them. I haven’t 😦 But how is your running going?? I’m so sad I can’t train for that half with you 😦 Would you be interested in doing any smaller races this summer? Sure! I’m up for a 5K. But I warn you that you will have to wait for me at the finish line for a bit 🙂 I am soooo sloooow. ha ha that’s ok! It will be fun to do a race with someone else and have something to look forward to! I’ll see if I can pick one out and let you know. Oh, I hate running too! Always have. But I love finishing 🙂 So we’re in the same boat. I’ve been using an old training plan I used for my first marathon. We’ve been running for time during the week and for distance on the weekends. If you’re curious I can email you the details. Oh my, these look sooo delish! I’m so hungry now. Thanks for stopping by my blog. Your post was great. Good luck on all your races! I think you should continue making them! You just must stop EATING them. Yep, that’s why you have friends. You can sell them and/or ship them to your favorite people around the world! Coincidentally, my book club is reading the book “Bread Alone” – and I think you should read it, too! I’m only 40 pages in, and it makes me think of you. I pick up my books this week for World Book Night! Not eat them?! Crazy talk! Just kidding. I go through spurts where I make them a bunch and then I stop. But then some other lovely dessert takes its place. I do try to bake for an occasion so I share the calories. I’ll have to look up that book. The one I’m reading is dragging horribly. I ‘ll need something better waiting for me when I finally finish. Have you decided which organization(s) will get the books? 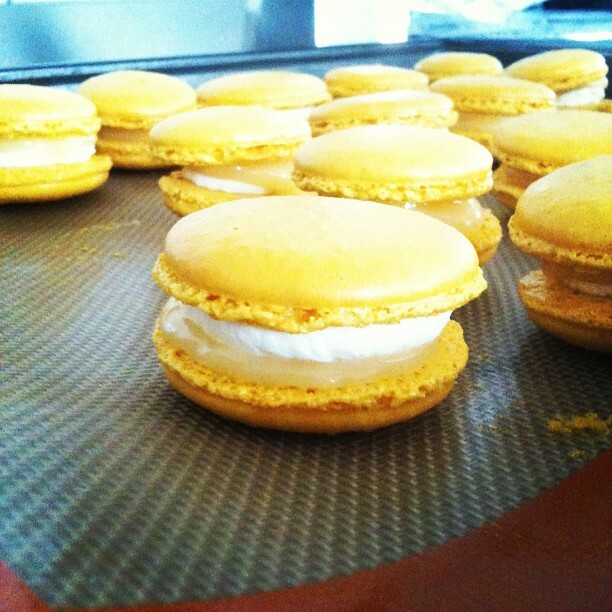 I can’t stop making macarons either!! There’s something very addictive about the process. Hi, I came over to check out my new follower and what a delight to be greeted by beautiful cookies. Clearly you are a blogger after my own heart. I saw you comment on a sewing blog and figured if you like sewing then I’d love to see what you make. Hello! No you must keep making them and please send them to my house.